Smart home products have made their way into just about every room in the home. 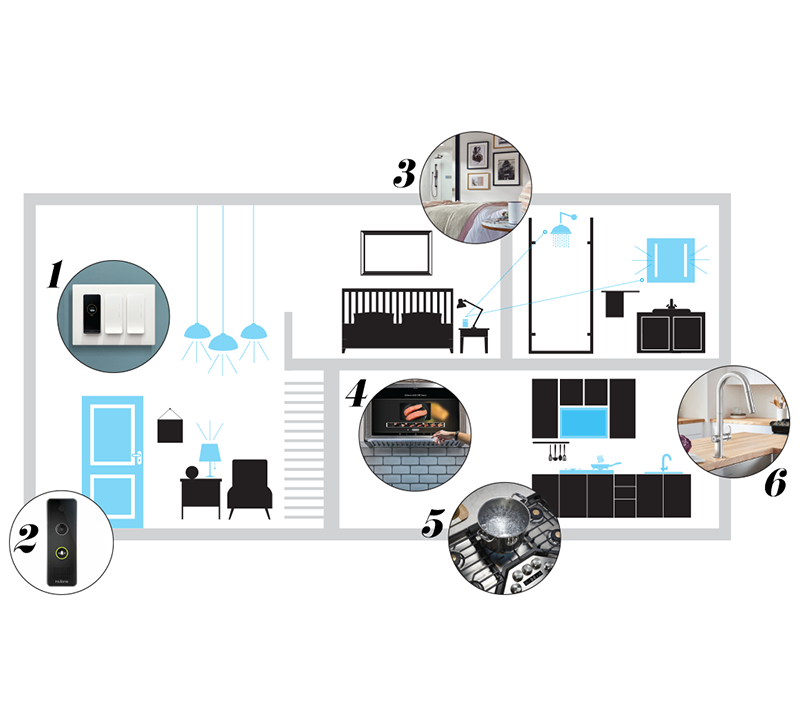 See how these smart home products are changing how consumers live and thrive in their homes. Light + Building's “Smart Living in an E-House” exhibit was a mockup of an intelligent house, equipped throughout with cutting-edge smart products that provide greater comfort, safety and efficiency for the user. Inspired by this exhibit, we’re bringing you Part 2 of our Year of the Smart Home series. We’ve curated a group of pioneering smart products available stateside for the bathroom, kitchen and living room, illustrating just how smart a house can be today. Each number on the image has a corresponding description below. Discover how each product is changing the way homeowners interact with their showers, appliances and other smart products. Smart light switches add smart functionality to existing lighting and fixtures, delivering whole room lighting control with one touch at the switch, app and voice activation. The U by Moen™ shower is now voice-activated by Amazon Alexa. This next-generation Wi-Fi/cloud-based digital shower offers mobile connectivity and unmatched personalization, providing homeowners countless ways to create their ideal showering experience with the push of a button ­— and now, the sound of their voice. Read Part 1 of our Year of the Smart Home series here.